The sleek and stylish design of the Tempo gives it real appeal. Plus the modern colour palette will really help your promotional campaign and brand to make a big impression. Made in Britain, these bottles offer innovative design, high quality, vibrant colours plus fantastic branding opportunities. 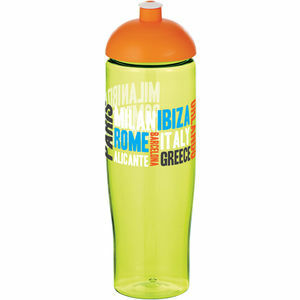 The bottle is manufactured from recyclable PET material and looks stunning with both our domed and flip lids. 700ml capacity. BPA free.